The Lilletind Child Carrier from Bergans allows you to share the outdoors with your little ones. It is robust and versatile and offers a focus on comfort and safety for both the parent and child. The torso length is adjustable to ensure whoever is the nominated carrier on that particular day can get the correct and most comfortable fit. The back panel is covered in ventilating mesh while the shoulder straps and padded anatomically shaped hip belts are covered in a soft stretch fabric to ensure a great fit for comfort, that won't slip and slide as you walk. 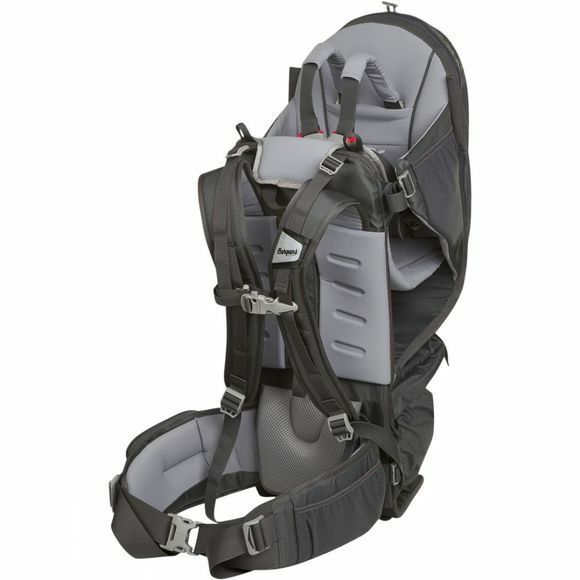 For the child there is an adjustable 5-point harness that prevents the child from falling, wriggling or climbing out while the back frame and seat height are adjustable to accomodate the child's growth and development. There are also adjustable stirrups for their little feet which will help reduce pressure that might occur on the child's back and separate side and head support pads are able to support a sleeping child for a cheeky mid walk snooze, these can be folded away when the child is awake. There is also a detachable cord for attaching a pacifier or favourite toy and a padded head rest in front of the child. The child will always sit at the same height in relation to the carrier, irrespective of back length, for comfort and safety. In addition there is also a fixed frame support plate that folds out to help keep the carrier steady when you are putting them in or taking them out. A large storage compartment under the seat will hold essentials for the day and can be detached for separate use, while a mesh zipped pocket on the outside is a great place for a bottle of water. A sun vizor/rain cover is supplied and can be attached or removed as required.